In House Pharmacy - GREENVILLE ANIMAL CLINIC & HOSPITAL,LTD. 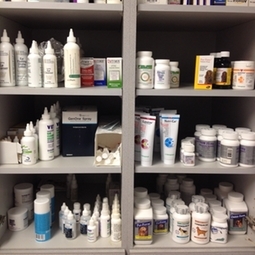 Greenville Animal Clinic features a fully stocked pharmacy to save you time and hassle. We maintain a complete inventory of prescription drugs, nutraceuticals such as glucosamine and fish oil supplements, medicated shampoos for a plethora of skin conditions, and parasite preventives to keep your pets free of unwanted parasites (both internally and externally). We are also looking to add an online pharmacy in the future so that products you order can be shipped directly to your door.